is normally released on the 17th workday of the month following the reporting month. The publication is based on data provided by Federal entities, disbursing officers. proanLtion w lle returned until *nacrtmnt of the legsatlin repeng the off budget stalus of these antite The estimates fow 1498 andl '9I6 n -Ith" t ihSdcumn t tav-e been ImUt MII" INhS [uKh ri..
Table continued on ext page. Current Fiscal Yer to Dat. National Ocean.c and Almospne,, Adm.,r.sis. '.r. Education for the handicapped ......... ....... .
Other ............... ....... .......... .. .
-1 -1 10 10 7 . .j^~ ...,^., ^, .^,...... .................t, ............... .
1 Rl O .P A. Payments for tax and other credits"
Payments for operation of low-income housing projects . Community development grants. .. ............... .
Management and administration ................. ..
Other ... .. .. ..
I1- 3 111 .' . O their ......... .......... .
Benefits payments and claims .................. . Judicial survivors annuity fund ................. ..
Subtotal .... ...... .................... .
Of De'le Mldarld ruand onal adee luncntion is bang carnvgd for .e currrenr Kt 'u'ccug benerliS or 'ty fulu're irent T'heU *' atg a, a n'rge era r.a-1 Ml. **a. n.Ph .1 .n ! 1 461 514 30' ?8 '~6 6? Obligations not guaranteed by the United States, issued by. Table 6. Schedule C (Memorandum)-Federal Agency Borrowing Financed Through the Iue of Public Debt Securities. Department of Energy ............................ . Rural electlricaton and telephone revolving fund ("
28.019 28902 14.563 8.013 21 056 29.504 11 386 41.997 1. ?f e rve Ol t.*i r 1 '954 m.rilaer retieenntl r bDeneflilt arp r e-n.g I T rr .i .. l.r ,.I'.. ..' .. P. ;. ..a''. '... I .. *. .. '' .. .. .
Black lung disability 50 52 -2 428 407 21. .
of Table 5 .. .49.644 59,267 -9,623 332.733 529,137 -196,404 ..
outlays 18 18 1,117 1,117 . Note Interfund receipts and outlays are transactions between Federal funds and trust funds such as Federal payments and contributions, and interest and profits on investments in Federal securities. to arrive at total receipts ana outlays ol trust funds respectively Included in total interfund receipts and outlays are $4,567 million in Federal funds transferred to trust funds for general revenue sharing. Corporation income taxes ,'0 88 4 4' 4.' I.
Unemploymenl insurance 51 0 2'9 18 49? Department of the the Treasury's financial operations. provides data on the cash and debt operations of the Treasury. 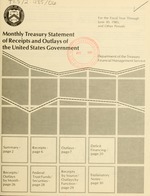 Treasury Bulletin (Available from GPO, Washington, D.C. 20402). statistics, cash management/debt collection, and special reports. individual receipt and appropriation accounts at the detail level.